Layered salads are not only delicious, but often a work of art as well. They can become a conversation piece at your next party or family dinner. 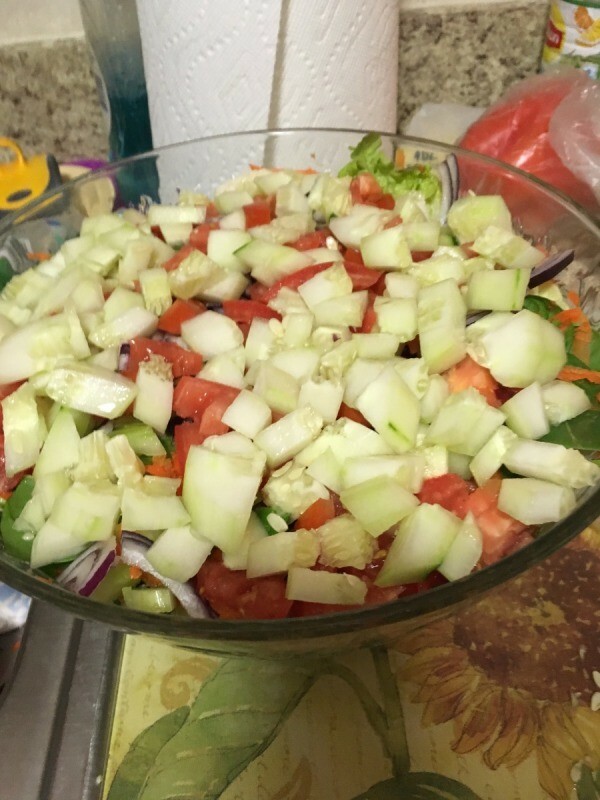 This page contains layered salad recipes. This is a great salad for a potluck or BBQ Cookout. Easy to make and I never have leftovers! Dollop the 3 - 4 tablespoons of Miracle Whip in the center on top. Cover well with plastic wrap. Refrigerate overnight. Toss just before serving. This is a regularly requested item at many family gatherings. I've taken this to work potlucks, family reunions, picnics, and even made it for several of my sister-in-law's bridal showers and baby showers! I'm always asked for the recipe and it always goes fast! Prepare veggies: Tear lettuce into small pieces. Chop green bell pepper, cauliflower and celery. Thaw the green peas. Cook bacon over medium high heat until evenly brown. Drain and set aside. In a 9x13 inch pan, layer the lettuce followed by the peas, green pepper, bacon, cauliflower and celery. I use a glass one because it is cool to look at! In a bowl combine the mayonnaise and the sugar. Cover and chill for at least 8 to 12 hours before serving. I started making layered salads instead of tossing them. It avoids people from picking things out of the salad that they don't like. 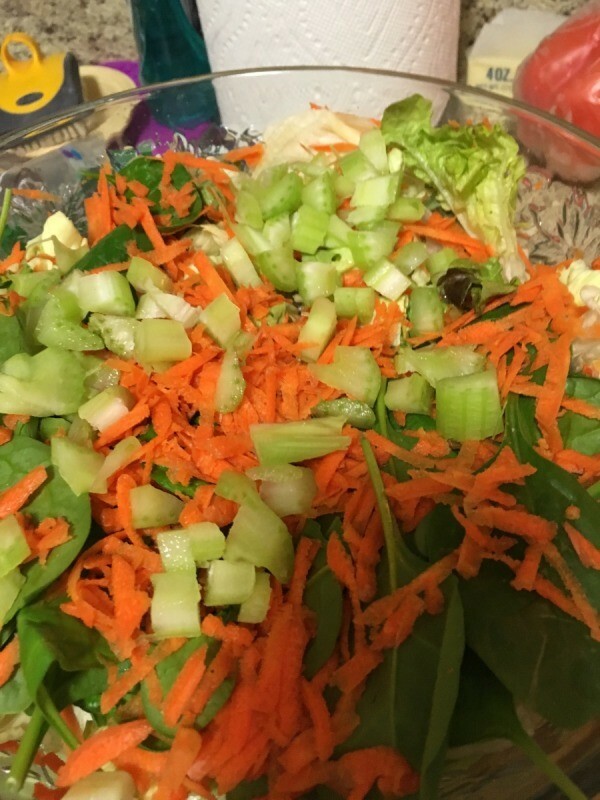 Using a large salad bowl, add salad fixings just as I listed them in the ingredients. As you get to the last few different items that you may think s people might not like, I put them in small attractive mounds on the top. So they dont get mixed. I also chop everything in my salad. Makes easier eating and more flavor. 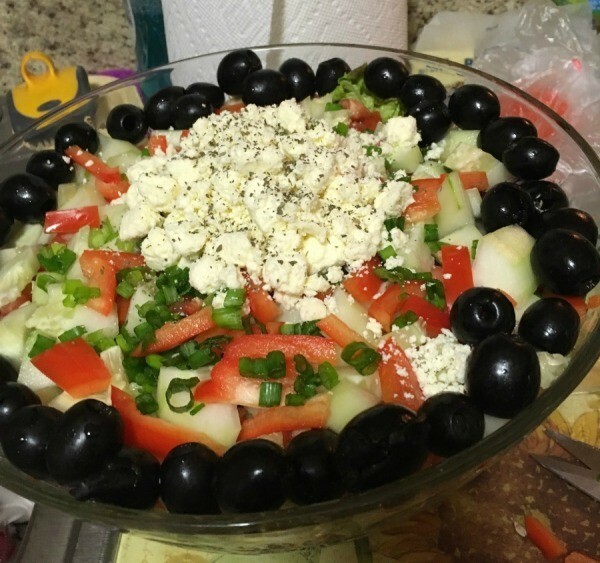 I put especially the feta and black olives and red onion in small humps in the middle. Then someone can still get to the salad without getting something they dont like. 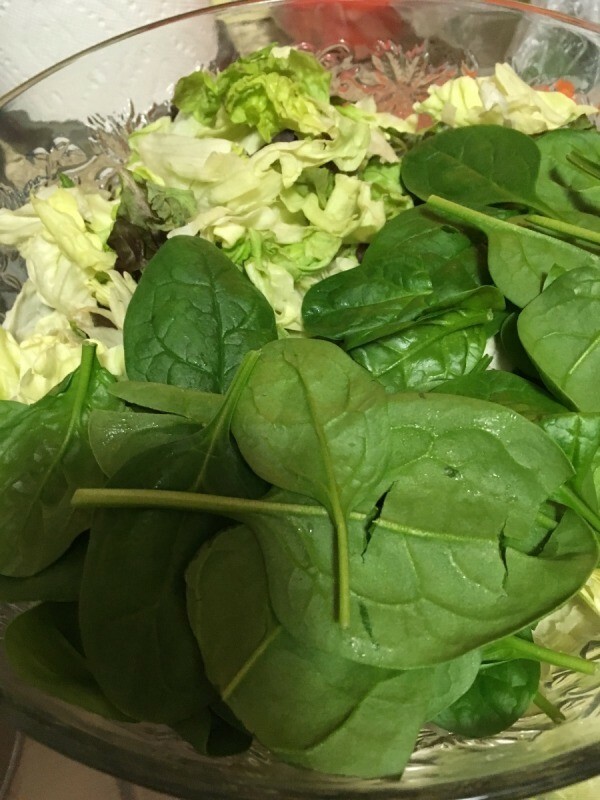 In a large bowl, layer lettuce, spinach, green pepper, celery, and peas. Spread with mayonnaise. Combine the cheeses and bacon over the mayonnaise. This looks very pretty in the serving dish as well as being very good! I like the bacon in this recipe! Got this recipe from my step-mother. Great salad! Layer vegetables, eggs, bacon in order given in large flat plastic pan with lid. Mix salad ingredients and spread over salad. Cook pasta according to package directions. Meanwhile, in a small bowl, combine the mayonnaise, lemon juice, sugar, and garlic powder; set aside. Drain pasta and rinse in cold water; toss with onions and half of the bacon. Leafy greens can be layered with meats, cheeses and other veggies to create an old fashioned salad. 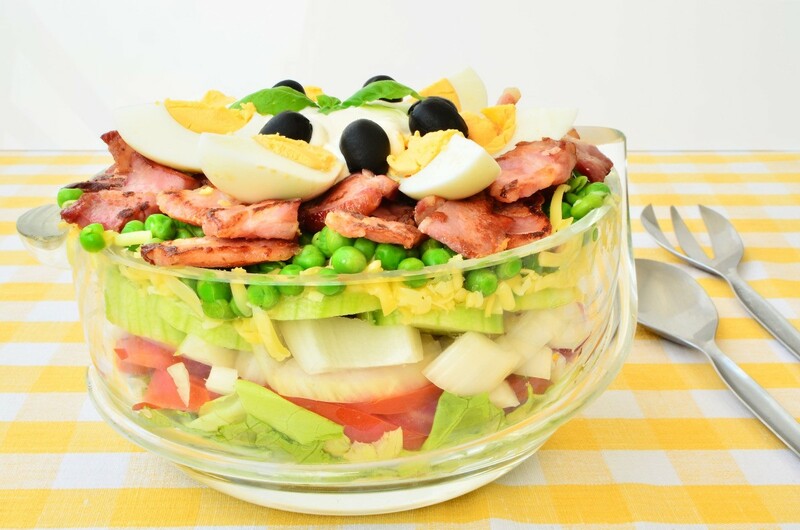 This guide contains recipes for layered green salad. 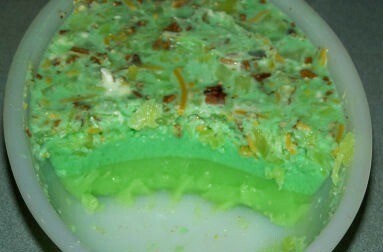 This page contains layered jello salad recipes. A fun, colorful salad can be created by layering jello. Layer first 4 ingredients in large bowl in order listed. Spread mayonnaise over vegetables. Sprinkle with sugar. Top with cheese. Chill tightly covered, for 8 hours or longer. Drain peas on paper towel. 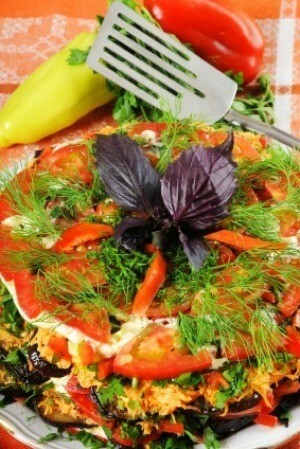 Place lettuce in large salad bowl. Layer chopped vegetables and peas over lettuce. Beat mayonnaise until it is of spreading consistency. Spread mayonnaise about 1/4 inch thick over peas. Sprinkle sugar and cheeses over mayonnaise. Top with bacon. Chill tightly covered, about 8 hours. Keeps up to 1 week.